When you have a dog meant to RUN all day, sometimes you end up running a lot too. And then you might do something crazy like sign up for an ultra marathon. I’ve been running for years and completed a marathon and many half-marathons. I even started a business where I took dogs on running sessions and covered up to 20 miles per day with dogs at my side. But I’m new to “ultras.” And I’m new to distance running on trails. Most of my distance running has been on pavement or sidewalks. My husband Josh and I signed up for a January 2018 50-mile trail race. Dogs aren’t allowed for safety reasons unfortunately, but our pup Remy can still train with us. I thought I’d write a bit about our training since we’re just getting started. If people seem interested, I’ll update this post as we progress. April 2019 update: We’ve now done three 50-mile ultras, the San Diego Trail 50 (twice) and the PCT 50. We’re training for our first 100-miler. I’ve updated this post a bit with more now that we’ve gone on much longer runs with our dog. 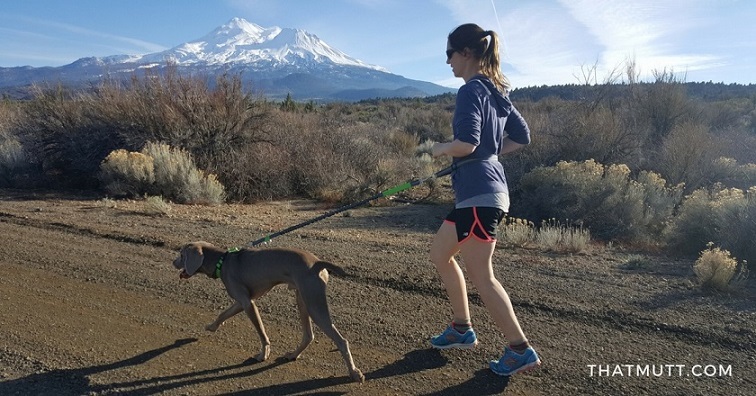 First things first, not all dogs are cut out for distance running, and not everyone agrees dogs should even go running at all. 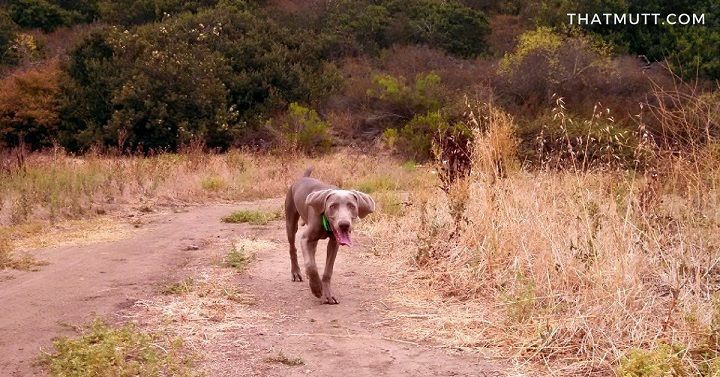 There were also people who believed I should not be running with my weimaraner until he was 18 months old. Heck, some people lost their goddamn minds when I took my puppy walking. See my post: How far can I walk my puppy? So, what it comes down to is knowing yourself and knowing your dog. Consult with your dog’s vet and breeder, and then ultimately you have to make the best choice. I personally believe running is great for most dogs and I tend to start them out running at an earlier age than most. This is because people are SLOW and when I run with my dog he is actually just trotting. You can read more about my general opinions on what age to start running with puppies HERE. This goes without saying, but you obviously need to gradually train your dog to handle distance running. My dog Remy has literally been training for distance running his whole life. He’s conditioned and adapted well to the many miles we put in. Remy has been walking daily since he was 8 weeks old, and he’s been running regularly a few times per week since he was 6 months old. This started with just 1-2 slow miles a few times per week and eventually a 5-mile “long” run on the weekend once he was a year old. Needless to say, Remy’s paws are tough and he’s in great shape with a lot of muscle. His joints also appear to be healthy, according to his vet. Once Remy was about 18 months old, I felt it was safe to start taking him on a weekly run longer than 5 miles. So we gradually did 6, 8 and eventually 12 miles while living in San Diego. Remy tags along for all of this (nothing like yoga with a dog helping!) except for days when it’s too hot for him or if we run over 20 miles. I did not take him on runs over 12 miles while living in San Diego. It was just too warm for him and he gives 110 percent at all times. However, we moved to Montana in August 2018, and at that time my dog was about 2.5 years old. Since then, we’ve started taking him on longer runs of 15-20 miles every other week or so and he handles it just fine. We also live in an area where he can be off leash almost all of the time, and I believe this is a big factor in allowing him to cover a greater distance with us. He can set his own pace, stop, speed up, etc. He can also eat snow or drink from the streams, although I always carry water for him. Our training is more about time on our feet vs. speed. We walk the hills and we typically don’t go much faster than a 14- or 15-min mile pace on our long runs. Obviously, we have to use common sense and for runs over 5 miles we evaluate whether or not we think Remy should go that day based on the weather. Our dog does not have an off switch. He will go until he drops, so it’s up to us to watch out for him if it’s even slightly warm or too cold. Like I said, I found Remy’s limit to be about 2.5 hours or 12 miles in San Diego, if it was cool enough. If it was hot out, we didn’t run with him. Now that we’re in Montana and it’s winter, I am comfortable taking Remy along up to 20 miles if he’s able to be off leash and it’s not too cold. In general, people can outrun dogs once we hit a certain distance. 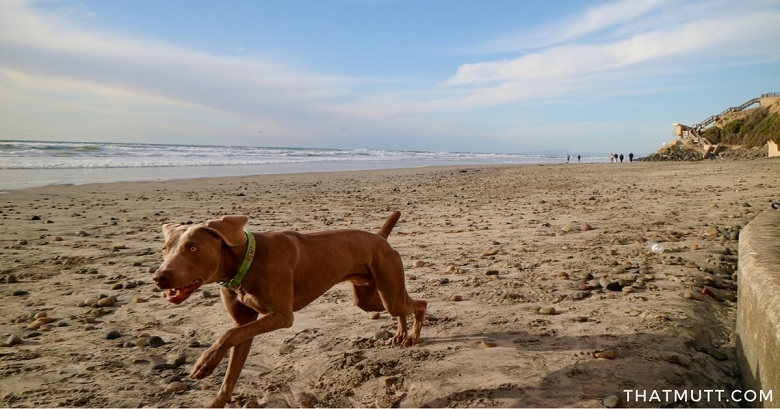 Dogs are fast, but most are not capable of the distances people can do. There are always exceptions, of course. Like huskies, weimaraners are not your average dogs either. They are bred for endurance! I don’t know how many miles the average bird dog covers in the field hunting, but my dog is bred for work! His parents are working dogs, and this pup is 100% committed to run, run, RUN! Running with a dog is relaxing for me, even if I’m running with a maniac like Remy. Time on the trail is my weekly meditation, and I’m so glad Josh can experience this too. This is why I love dogs so much. They’re eager for adventures and the outdoors and they’re just as eager to crash on the couch afterwards. Yes, even weims eventually do crash! Dogs are grounding for me. Inspiring, simple and peaceful. Our weim may not be a trained hunting dog. He’s not a very obedient dog or a well-mannered dog. But he’s an adventure dog! He leads us where we want to be. How about the rest of you. 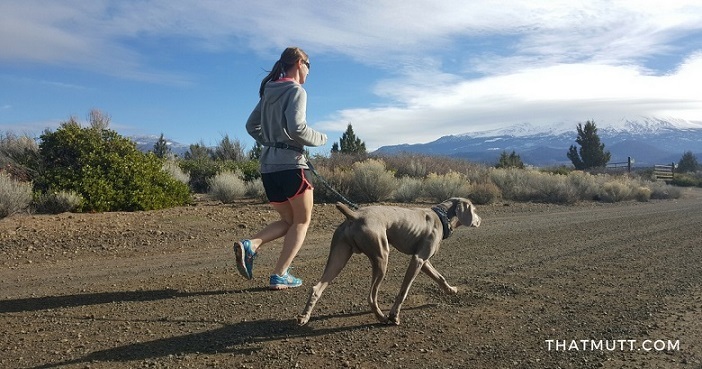 Do you run with your dog? 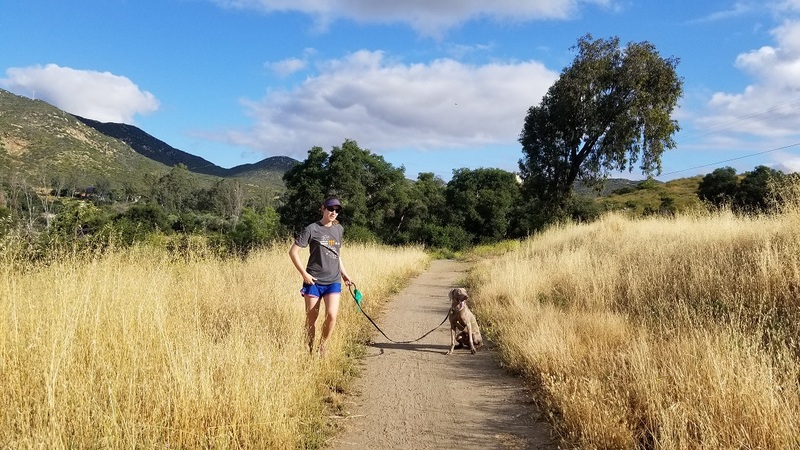 Do you have any questions about running with dogs? -Lindsay, Josh, Ace & of course Remy! Follow along on Instagram HERE. P.S. Just want to give a little shoutout to the world’s best dog, Ace! He may be retired, but I do not forget the thousands of miles we covered together. He’s very much enjoying his retirement. Good boy, Ace! 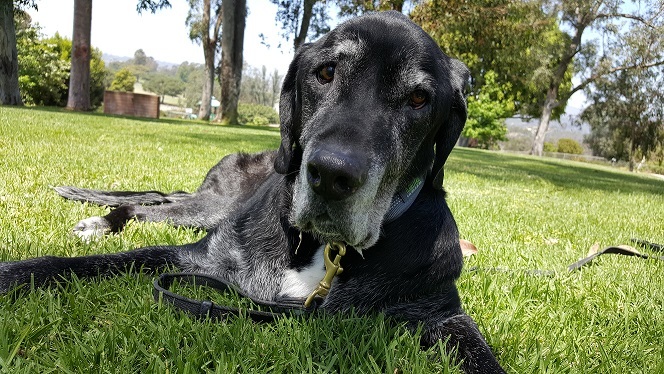 May 2018 Update: Ace has passed away. Thank you for everything, Ace! Wow! An ultra. That is so cool. I’ve only made it to the marathon distance (sans dog). I love trail running, though, and even for my 10K runs, that was my preferred venue. Since getting a dog, I’ve actually stopped running because my beloved Baxter doesn’t have enough energy/inclination to run. Plus we’d have to stop every few steps to sniff. Good for you, Josh and Remy for doing this together. It sounds to me like you’re taking a responsible approach. I like how you say you’ve “only” made it to the marathon distance. Haha! I didn’t know you’ve done a marathon! I had a goal to run a full marathon before I turned 25… so it’s been a little while 😉 My husband and I did it together too. It’s really nice to have someone to go through the training and the race with. I was happy to say I’d done it and know that I didn’t want to do it again. The race was tough, but the hardest part was the training. It was just all consuming, and I had too many other things I wanted to do! Caitlin, my dog Remy loves to sniff on walks (most dogs do) and a trainer we are working with suggested I use a “working mode” with Remy where he walks in a formal heel and no sniffing allowed and then we have our “non-working mode” where he can sniff, walk ahead, etc. With running, you can do the same thing. Maybe you have 5 to 10 minutes of “work mode” where he is expected not to sniff and the you reward with 5 minutes of walking/sniffing. Just an idea. Great post – I’ve done a couple of marathons and am vaguely toying with an ultra, but probably not for another few years. Since getting Archie, my cocker spaniel, last year I’ve actually done much less running as I’ve been walking him, and working on his reactiveness. I’m getting my first ever car in a few weeks and am super ecmxcited to be able to head out of the city and rxplote quieter trails. One question – do you always run with Remy on a leash? And if so is it one that goes round your waist? I keep Remy on leash because where I live there are too many bikers and other dogs around and Remy isn’t the best behaved. I would LOVE to have him off leash and we only do that when we travel to more rural areas in northern California. 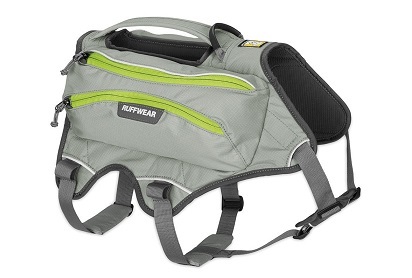 I do use the hands-free leash around my waist but only on quieter, wider trails. I highly recommend a hands-free leash and I linked to ours in the post. That being said, I can’t use it all the time because I have less control. It all depends on where we’re running and how busy and wide that trail is. 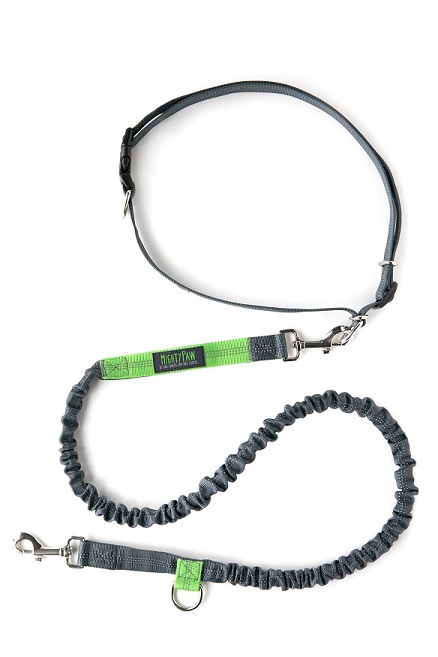 Remy gets too excited and pulls towards other dogs so on some trails I use his normal 6-foot leash that I hold + his Gentle Leader or prong collar. Basically, we change up our gear depending on where we’re running! We agree to disagree but I appreciate your comment. This post is just my take on it and I wouldn’t expect everyone to agree. Other opinions are welcome here. There has never any shortage of opinions about running. I am 64 and a life long runner. Some still advise me not to. I run marathons, half-marathons, and many, many 10ks and 5ks and have had only minor injuries almost all related to tripping. I love running! We welcomed our last dog into our family with the idea of having a running buddy and for about the first year, she was the very best!!! But then she became a maniac! She clothes lined me 4-5 times and the last time we ran together, she broke away so hard that the leash tangled with my finger resulting in a broken bone. On trail runs she would start out right by me then leave to chase rabbits and refuse to come back. I tried all the techniques from your blog and every other reasonable bit of advice without success. Now my daily routine is to run then come home and walk this crazy dog on high alert for rabbits, squirrels, etc. We love each other dearly and she has many other fine qualities, but caring about my well being is definitely not one of them. I think it is great that you have a dog that runs with you. It is always nice to have a companion – especially on trails. Several people who I run with occasionally bring their dogs and I am very glad, especially in remote areas (I am the slowest) since they come back to check on me. Enjoy the training and what sounds like a huge accomplishment. I will let you know when running starts to ruin my health. I’m so sorry to hear your dog has caused you some injuries. That must be frustrating. Speaking only for myself, running has made me healthier and stronger. I had knee problems 10 years ago before I became a serious runner. I would run occasionally and my knees or ankles would always hurt. In my case, the more I ran, the stronger my muscles became and the fewer injuries and problems I have had. I’ll also let you know when running starts to ruin my health. As a Doctor, the thousands of runners *without* knee issues probably aren’t ending up as your patients…..
EVERYTHING is about training. I run regularly with my dog (zwergschnauzer) different distances. From 10km up to 100km. When we are on run, SHE knows that we are working. No sniffing and chasing! On hot days we run slower and cool her in every lake or stream. On cold days I just give water when I drink. We are together about 6 years – SHE was never injured! Everything is about training (sport and mental). Hunting dogs on regular “wild boar”hunting day are running all days. The “shepherd dog” are working everyday in hot and cold conditions without almost any rest. I think that every owner could see how much his dog could do. Of course the “fat and heavy” breeds are just not for sport. But “athletic” and hunting breeds are perfect for run ( of course not running behind bike). Some dogs are runners while others are not. I have a 10 lb terrier cross who can easily do 10K and then in the afternoon be ready for another. (I’m not) She is now 12 years old and we still do 6-10k in the summer but not in the winter because it is too cold for her arthritic joints. She also has a major heart murmur but if she wants to go we go. When she doesn’t we don’t force her. Our other pup is now 18 months and he is always ready to run so we take him winter or summer. I love when smaller dogs are out running too. So many of them are great running buddies.